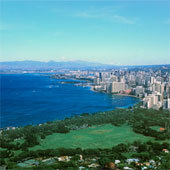 Which Are The World’s Cleanest Cities? OK so Happy Memorial Day. Good to get that in. Bill Nye, the Science Guy, was online Friday, May 28, at 1 p.m. 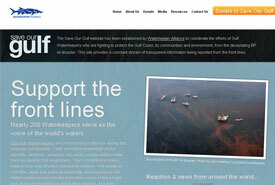 ET to discuss the Gulf oil spill and the latest efforts to cap the well, including the “top kill” maneuver. Chantilly, Va.: Why is the oil still gushing out after more than a month? I always assumed they need pumps and other equipment to get the oil to the surface. Where is the pressure coming from to continue to let the oil out of the well? Bill Nye: The pressure driving the huge flow came or comes from ancient bacteria that fed on ancient sea plants or plankton. The bacteria gave off natural gas, also called methane. It’s trapped in a cavity under the seafloor. This gas is under about 460 atmospheres (6,800 psi) of pressure. That’s plenty to spew oil for years, or even decades. Bill Nye: The head BP guy this morning made the extraordinary, and probably not quite accurate, claim that no oil has been coming out, while the mud is flowing. He probably just meant the flow of oil is way down. Such an estimate is very hard, because most of the oil doesn’t make it to the surface. It becomes neutrally buoyant goo. Yikes. Please follow the link for the rest of the Q&A. It is pretty basic. During a press conference on May 29, 2010 at 5:10 p.m. BP Chief Operating Officer Doug Suttles announced that the Top Kill will no longer be continued. 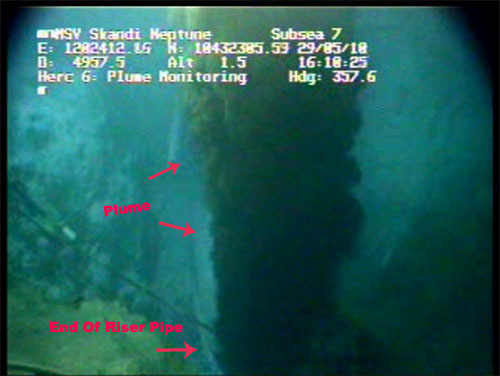 ROV video feed screen capture from May 29, 2010 at 4:10 p.m.
As can be seen in this Remotely Operated Vehicle (ROV) video feed screen capture taken at 4:10 p.m. today, May 29, 2010, a large plume of material continues to billow out of the end of the riser pipe. BP’s next move is to cut off the bent Riser Pipe and replace it with a “Lower Marine Riser Package Cap” (LMRP Cap). Mr. Suttles stated that he believes that the LMRP Cap will capture “a great majority” of the flow but not all of it. Adm. Landry stated that the ultimate solution remains the relief well. The relief well appears to be weeks away from completion. This is so disturbing…It is looking like August. (CNN) — Icelandic authorities evacuated about 800 people early Wednesday when a volcano erupted beneath the Eyjafjallajokull glacier, an emergency spokesman said. The first evacuations began at 2 a.m. (10 p.m. ET Tuesday), according to Rognvaldur Olafsson, chief inspector at Iceland’s Department of Civil Protection and Emergency Management. He said everyone in the area was safe. “We have located the fissure that is erupting under the glacier,” Olafsson told CNN. He said scientists are currently doing aerial reconnaissance of the area and that officials would know more when they return. So will it effect the environment. Yes. Anything that disrupts air travel is a good thing because air travel is one of the largest causes of global warming. Will it cool the planet any. Probably not but if Kitra goes off it could be a major event and the last three times “Eyja” went off Kitra did too. So keep on watching folks. Air travel here was disrupted too so it was nice to sit on my swing out back and look at the stars with no blinking jet lights. And yes, an Oil Rig blew up and sank. What, that doesn’t happen everyday? I guess the gulf needs 42,000 gallons of oil spilled in it every day for God knows how long. Authorities continue to monitor the size and direction of a Gulf of Mexico oil sheen by air, while using robotic underwater equipment to try to shut off its source at a wrecked deepwater drilling platform. The Coast Guard and the companies that owned an operated the rig plan a Monday afternoon news conference in Robert, La., the site of a command center established over the weekend to deal with the crisis. The oil has been leaking at a rate estimated at 42,000 gallons a day. Workers are trying to make sure the oil doesn’t reach the Gulf Coast’s fragile ecosystem. An explosion on the floating deep water rig last Tuesday night led to a huge fire and the eventual sinking of the rig. The search for 11 missing workers was called off on Friday. Crews began using a robot submarine Sunday to try to the leak nearly a mile below the surface, but said it would take at least another day before they knew whether the job was completed. The Coast Guard said the oil spill was expected to stay 30 miles off the coast for the next several days. The robot submarines are trying to activate valves at the well head. If that doesn’t work, crews are also planning to drill a relief well to cut off the flow – which could take several months. What appeared to a manageable spill a couple of days ago after an oil rig exploded and sank off the Louisiana coast Tuesday, has now turned into a more serious environmental problem. The new leak was discovered Saturday, and as much as 1,000 barrels – or 42,000 gallons – of oil is leaking each day, Coast Guard Rear Adm. Mary Landry said. This is what they want in the artic? If they drill off Virginia, is this what they want coming up Chesapeake Bay?